Cover Artwork: Lagoon at Albert Head, c. 1936, Emily Carr (1871-1945), oil, 51.5 (h) x 72.5 (w). Provided by the Collection of the Art Gallery of Greater Victoria. The Thomas Gardiner Keir Bequest. 1994.055.003. Saviours in This Little Space for Now brings together two greats artists—Emily Carr (1871-1945) and Vincent van Gogh (1853-1890). Their spiritual yearnings and frustrations with societies that did not understand them seem to find a home together. Saviours in This Little Space for Now suggests that true salvation can be found in the greatest paintings and creations of our time. 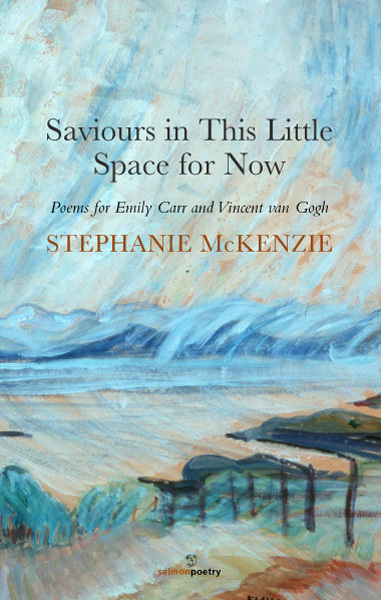 Stephanie McKenzie has published two other collections of poetry with Salmon, Cutting My Mother’s Hair (2006) and Grace Must Wander (2009), and a monograph, Before the Country: Native Renaissance: Canadian Mythology, with the University of Toronto Press (2007). She holds a Ph.D. in English literature from the University of Toronto. McKenzie was born and raised in British Columbia but lives on the opposite Canadian coast now in Corner Brook, Newfoundland. 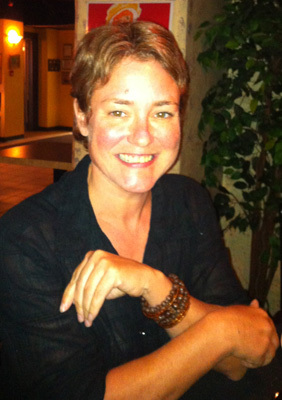 She teaches in the English Programme at Grenfell Campus, Memorial University, where she is an Associate Professor. “[Mr. Carr] built a high fence and plant[ed] a row of bushes . . .
I’ve tried to bury his secret far below my heart. But this doesn’t happen. Cannot. The dark has been told. the men at the races hover like tentacles. Huge jellyfish. Boys’ Own Nature Studies. Father knew I loved woods. No dolls but a book, gift good for growing men. sleep. And father I cannot forgive. these forests female to the core. Some days we rise in earnest, convinced it will not come. Your pink peach tree juts into the bluest sky. Today is a good day to wash out clothes. Tomorrow we can’t be sure things will rise just so. We curse the coming on. I wanted beauty, colours in your pink peach tree. Flytraps. Scratch at lungs of air. The crowds gather in front of your sunflowers. But I can’t bear it. Can’t take the truth in these stalks. Your pink peach tree, Van Gogh. Behind, there is nothing to run to. No field, no sky. Warm, past verdant, flicks stone-hewn faces. blossoms worlds away from sober brushes. their flights in fields, we sit laden. Curious to fly. You linger like springs in Nuenen. It was a curious discovery and a rich one. I had just finished teaching a graduate course in Vancouver on the psychologist and spiritual writer Henri J.M. Nouwen and one of the lectures dealt with his understanding of the life and work of his compatriot, Vincent van Gogh. Nouwen’s most popular course at Yale University was on Vincent – his art and his spirituality. Nouwen’s insights provided a unique aperture into his own theological and psychological travails. A few hours before boarding my plane back to Connecticut, I decided to revisit the Vancouver Art Gallery – in particular the Emily Carr collection. As I was leaving, I happened upon a small stack of books near the door in the gallery bookstore. The cover drew my attention but the contents are more than compelling; they are epiphanic. Stephanie McKenzie, a British Columbia native now teaching English at Memorial University’s Grenfell campus in Corner Brook, N.L., has had a long and creatively nurturing attraction to both the 19th-century Dutch artist van Gogh and the Canadian writer and painter Carr. Her approach – both academic and poetic – bears close attention. Although the above poem is about Carr, the van Gogh resonances, parallels and personal convergences of mind and spirit are adroitly and obliquely suggested. This is what poetry does; it paints a mental landscape of connections. Saviours in this Little Space for Now is a surprising treasure.